You have the ideas and the content but are you conveying them in the best way possible on your class or education blog? I’ve been visiting many blogs recently and have identified some common “mistakes”. Of course, I use the term “mistake” lightly. We all make mistakes and it’s important that students know this. It’s the way we learn. I know I have made a lot of mistakes on my own blogging journey. Although I’m certainly still learning, I feel like I’ve improved my blogging along the way. A lot of this has been due to trial and error, reflection and working with blogging role models like Linda Yollis, Sue Waters and others. Sometimes having hints on more effective practices can provide you with a shortcut to your ultimate goal: gaining readership and audience engagement. After all, an active and authentic audience can really benefit you and your students. This compilation of tips is certainly not exhaustive and is only opinions. As always, find out what works best for you, your students and your audience. Please comment and help refine this advice. Short on time? Scroll to the bottom of the post for a handy infographic summary. In my early days of blogging, I made the mistake of having my class name (e.g. 3KM) or year (e.g. 2010) in my blog URL. This is frustrating when you start teaching a different year level and you need to set up a new blog from scratch! Simply having your name in the URL of your blog might be a better option (e.g. mrsmorris.edublogs.org). It may also be easier for people to remember. There are many ways for readers to follow blogs that interest them, including RSS feeds and social media. The most straightforward way for many people to engage with new content on your blog is to subscribe by email. Make sure you have this set up on your blog so readers can be alerted when new posts are published. In recent years, many blogs have started looking less “bloggy”. The old standard blog theme used to display the full text of posts in reverse chronological order. Pages were up the top and you had a left and/or right sidebar. Nowadays, there are a wider variety of themes available. A magazine style theme is popular as it draws attention to feature images (although if you don’t have great images in your posts, this can look unappealing). Some themes also only show a snippet of the post text on the homepage. This allows readers to easily scroll to find a post they’re interested in, without having to scroll past entire posts. Take a careful look at your theme choice. Is it attractive? Functional? Easy to navigate? If in doubt, stick with a simple theme as ease of navigation is really the most important factor for a reader. Changing your theme or header too frequently can also be confusing for your audience so once you find a theme that works, it’s best to stick with it for a while. As a visitor to many blogs I find it very frustrating to not know who writes the blog and what the blog is about. This is a surefire way to have readers close their tab. Don’t keep your readers in the dark; even if you only have one page, make it an About page. You don’t have to reveal too much personal information like your school name (if it’s a class blog). However, some general information like your grade level, subject area and country can be really helpful. Widgets can be fun and are certainly appealing to students but be selective. Not only can too many widgets make your blog look cluttered, and take away from the content of your posts, but they can slow loading time on your blog. Of course, some widgets are essential, like a search box. This simple tool makes it much easier for readers to find what they’re looking for, especially when posts are no longer on the front page of your blog. Research shows that 79% of readers only scan text when reading online. It can be difficult to scan long paragraphs. I know it feels almost unnatural for me to read long paragraphs online and I often have to fight the urge to scan. Reading on paper is different to reading online. Therefore writing online is different too. The more I read and write on the web, the more I appreciate a layout with short paragraphs. You may not teach your students to write traditional paragraphs with only one or two sentences, but this can work when writing online. Along with avoiding long paragraphs, it’s a good idea to use other features to make your posts easy to scan. Try subheadings, bullet points, bold words or numbered lists. Limited colour palettes and predominately left aligned text also make posts easy on the eye and more likely to be read. Adding links to your blog posts not only give your readers’ eyes something else to grab on to, but helps back up your opinions, connect thoughts, provide background information and reference your ideas. Many bloggers (myself included) start integrating links by adding click here into a sentence, or worse, multiple click heres. How confusing. This is a pretty clunky style of writing that interrupts your flow. When you add a link you might also want to tick the box to have the link open in a new tab. You want people to return to your blog after visiting your links, not get lost down the rabbit hole of link clicking. Learning how to hyperlink well can improve the overall quality of your posts. It’s even a skill that Silvia Tolisano argues should be taught in the classroom. Cliche or not, a picture tells a thousand words. Imagery can really add interest to posts and aid comprehension. You aren’t just limited to photos or illustrations, however. Infographics, diagrams, charts, slideshows, videos and polls all make excellent visuals to bring your posts to life. The Edublogs Teacher Challenge offers a comprehensive guide to embedding a range of visuals in your blog post if you’re looking for specific tools to use. Many bloggers don’t realise you can’t use anything you find on the internet and unintentionally publish copyright material in their posts. This is not only ethically incorrect but you could be violating copyright laws. Using any old image you find on Google is not an option so it’s important to familiarise yourself with Creative Commons and Public Domain images. Otherwise, just use your own images in your posts! 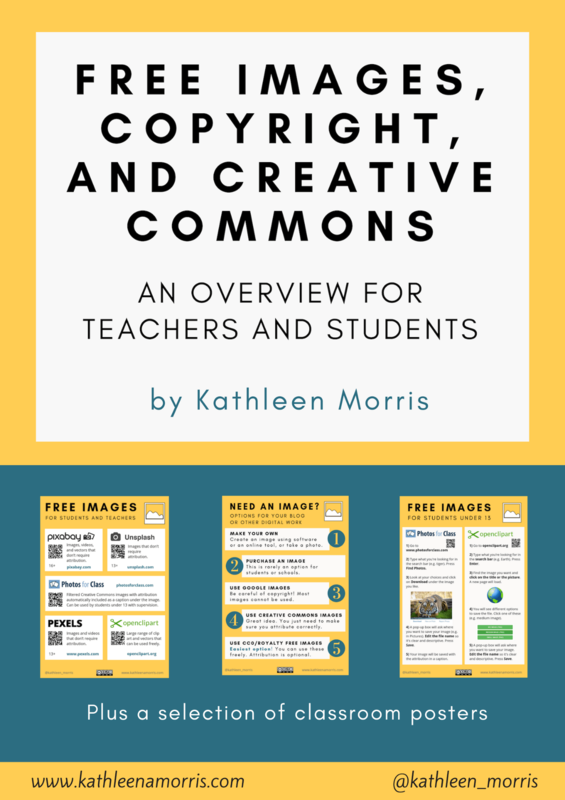 The Educators’ Guide to Copyright, Fair Use and Creative Commons is a handy resource to find out more about this topic. It is so tempting to hit publish once you complete a post, but distancing yourself from your blog before publishing can really enhance the quality of your work. Letting your post “marinate” for a few hours or days after you’ve written it can be a powerful strategy. Looking for typos and other errors with fresh eyes can also be more effective. You might even think of new perspectives or different ways to explain your topic. Don’t forget to preview your post before publishing too. This will ensure your formatting is clear and easy to read. I also find I pick up mistakes more easily in preview mode, rather than in the visual editor. Many beginner bloggers have experienced the dreaded consequence of copying and pasting text from Microsoft Word into a blog post. It is a big no no! Doing this can give you bad code which can ruin the layout of your blog. If you do want to copy and paste from Word you should first paste the text into a plain text editor (Notepad or TextEdit) and then copy and paste that text into your post editor. If you want to read more about this, check out Sue Waters’ post. If you use a WordPress blogging platform, like Edublogs, Global2 or WordPress.com you are probably familiar with tags and categories. Categories are meant to provide a broad grouping of your posts. Tags are used more for describing specific details. On a class blog post, the category might be Maths and tags might include addition, subtraction, number facts, homework etc. There are different schools of thought but in general, you don’t want to assign a post to too many categories or have too many categories on your blog overall. Only create a new category if you will be writing other blog posts that fit into that category. On the other hand it’s a good idea for a post to have multiple tags. Having tags and categories will increase the chance that readers will be able to find your content. If you’re interested in learning more about tags and categories you can read up on some best practices for WordPress. Not having a call to action at the end of a blog post (typically questions) is a mistake. Comments can bring your blog alive and actively inviting them is crucial. Get into the habit of constructing one or two open questions to complete each post. Acknowledge your readers’ comments, interact with them and they will be encouraged to comment again. This is not only a great way to increase activity on your blog, but is good online etiquette to model for your students. Taking the time to develop your blogging community can really help transform your professional practice. Some people wonder why they’re not getting comments on their blog. This is a complex issue, but often the simple reason is, they’re not commenting on any other blogs. Building your audience can stem from being an audience. One of the real benefits of blogging, over other digital or print platforms, is the possibility for connecting and collaborating globally. Don’t miss out on this opportunity. Collaborating doesn’t have to be complex. It can begin with a simple comment on another blog. You never know where that could lead. Spam comments are an unfortunate part of blogging. You may have a plugin like Askimet installed on your blog to pick up spam automatically but it’s not foolproof. Don’t be naive. If someone has commented about online essays, online courses, or just random stuff, it’s probably spam and it would be wise to mark it as such. People have different opinions on the topic of how often you should post on your blog. I don’t think there are any hard and fast rules on this one. I know plenty of excellent blogs that are only updated every now and then. I think the biggest problem arises when someone publishes a lot of posts in quick succession and then not at all. It can be confusing for readers. When you’re trying to build a core audience (like families on a class blog), making your schedule more predictable can be advantageous. Publishing rules and guidelines on your class blog ensures that all readers know what is expected of them. This is a great way to model appropriate online behaviours to students while ensuring your blogging program runs safely and constructively. It’s always a good idea to make parents aware of your blogging rules and guidelines when obtaining their permission to blog. If you have a class blog, parents and families are you most obvious audience. Despite the potential to have this ready-made authentic audience, you can’t leave family involvement in your blog to chance. I have recently completed a comprehensive guide to involving parents in your class blog on The Edublogger. Be sure to check it out to get ideas that could work for you and your classroom community. SAMR is a popular model used to represent effective integration of technology in education. It stands for substitution – augmentation – modification – redefinition. A lot of teachers seem to begin with substitution on their blog. They might post a worksheet or writing prompt. Any starting place is a good starting place but it’s important to question how you can move beyond that. What can you do with blogging to enhance student learning that you couldn’t do without that technology? Silvia Tolisano discusses this issue thoroughly on her Langwitches blog. I hope these tips help you avoid some of the mistakes I’ve made and fast track you to reaping the rewards of educational blogging. Forget the rules, and learn from first-hand experience instead. There’s so much more to be gained from not knowing how to do things the ‘correct’ way, and learning to do them your own way. Start blogging, learn as you go and have fun! 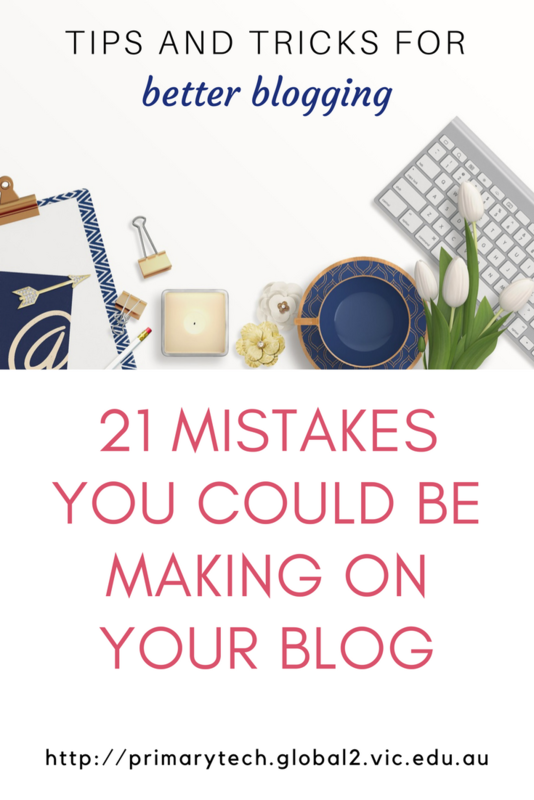 Can you share your blogging mistakes? Can I say we’ve really missed your energy and enthusiasm in the blogging sphere! I think with so many different ways to connect now, we’re losing that ability to have really good conversations. The commenting section is a place in a blog is a good place for those interactions. I know I’ve been in a vicious circle of not commenting, therefore I don’t get comments, which makes me less inclined to blog as the interaction isn’t there. So if anything, you blog prompted me to write a comment and commit to commenting regularly on one person’s blog in my RSS feed. Thanks so much for taking the time to comment! I agree about losing the ability to have those longer conversations. I enjoyed commenting on your blog recently too and it also reminded me that I need to get back into commenting more. In other words: take my own advice! You’re right that it can be a vicious cycle of sorts too. That’s definitely more food for thought for people! Thank you for these tips. They are specific and serve as great reminders! I appreciate what you have to say. It now gives me more confidence to continue blogging. So glad the tips are helpful! I think there are often things that you know in the back of your mind but reminders can be helpful, no matter how long you have been blogging. What a wonderful compilation of tips for better blogging! May I add one more, especially for blogs like yours that seem to attract plenty of comments? While comment threading is wonderful, too, I like to see date (and time) stamps on comments, as well as on blog posts, to give readers and co-commenters a feel of freshness. Thanks so much for adding that tip. It’s a good one and I totally agree. I feel like there might be a bit of a trend with some blogs to remove the time stamp in order to extend the shelf life of the writing? As a reader, I find that so frustrating though. It’s hard to know whether advice from a post is current if you don’t know if it was written last week or ten years ago. Comment threads are really useful too. I remember in the early days of blogging when we didn’t have that feature so it could get confusing. Really appreciate you adding your insights, Paul! I think one mistake educational bloggers make is not starting! At least that is my first mistake and I hope to correct it. Your tips are a boost in the right direction. You’re exactly right! I hope these tips haven’t scared off or overwhelmed people thinking about starting blogging. In some ways I think ignorance is bliss when you first start. I know it was for me. It can be good to forget about all the finer details without layout etc and just get going! It’s great to hear from you again and the email subscription is really getting me back on track with my class blog! I think I need to dive back in and get started-taking on board Richard Branson’s idea! Could you recommend a class blog that has links to individual students own blogs where they can display their own work? I need to investigate as an option for some research/informative work we are currently developing in our classroom. Great to hear from you! So glad to hear you’re keen to get back on track with your class blog. I know how easy it is for blogging to be on the backburner when we have so many other priorities. 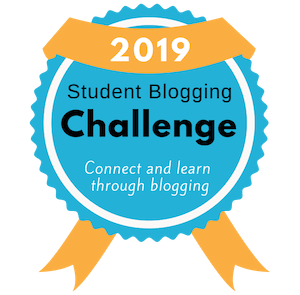 The Student Blogging Challenge is also set to start on Oct 1. You might not want to take part but it’s a good place to look for examples of other class blogs. If you check out this spreadsheet of classes that have already signed up for the challenge, you will see the blogs highlighted in purple have the student blogs linked on the sidebar. I hope that helps? I’m Back in the Blogosphere!